He later tweeted: "A life is like a garden. Perfect moments can be had, but not preserved, except in memory." He signed off what was to be his final tweet with "LLAP" - a reference to his character's famous catchphrase, "Live long and prosper". Dani Nimoy said her grandfather was an "extraordinary man, husband, grandfather, brother, actor, author - the list goes on - and friend." She added that special merchandise was being added to Nimoy's website, with all proceeds going to the COPD foundation. George Takei, who played Hikaru Sulu on Star Trek and was a friend of Nimoy's, paid tribute to the actor. "The word extraordinary is often overused but I think it's really appropriate for Leonard", Mr Takei told US broadcaster MSNBC. "He was an extraordinarily talented man but he was also a very decent human being." Thousands took to Twitter to pay tribute after Nimoy's death was announced, including Star Trek actors past and present. William Shatner, who as Captain Kirk acted alongside Nimoy for years in Star Trek, said he loved the actor "like a brother". "We will all miss his humor, his talent, and his capacity to love," Mr Shatner said on Twitter. Wil Wheaton, who played Wesley Crusher in Star Trek: The Next Generation, said: "We stood on your shoulders, and wouldn't have had a galaxy to explore if you hadn't been there, first. Thank you, Leonard, Rest in peace." It was Nimoy's casting as Spock in 1966 that made him in a star and, in many ways, defined his acting career. His two volumes of autobiography - "I Am Not Spock" in 1975 and "I Am Spock" two decades later - seemed to epitomise his mixed feelings. After the end of Star Trek's initial run, he played master of disguise Paris in the hit adventure series Mission Impossible. 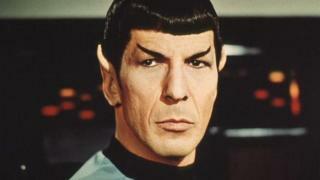 Nimoy announced that he was suffering from COPD last year, writing: "I quit smoking 30 years ago. Not soon enough. Grandpa says, quit now!!" 1954 Marries Sandra Zober. Two children, Julie and and Adam, follow.